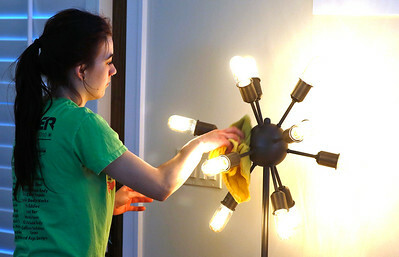 H. Rick Bamman - hbamman@shawmedia.com ProTidy employee Katie Wegner dusts a beadroom light fixture in a Barrington Hills home on Thursday, March 17, 2016. ProTidy employes 24 people and can serve about 170 houses a week. H. Rick Bamman - hbamman@shawmedia.com ProTidy employee Racquel Wenberg dusts furnature in the entrance way of a Barrington Hills home on Thursday, March 17, 2016. ProTidy employes 24 people and can serve about 170 houses a week. H. Rick Bamman - hbamman@shawmedia.com ProTidy employee Racquel Wenberg uses a soft cloth to wipe down furnature in a Barrington Hills home on Thursday, March 17, 2016. H. Rick Bamman - hbamman@shawmedia.com ProTidy employees use a bucket of soapy water and a soft cloth to clean a Barrington Hills home on Thursday, March 17, 2016. H. Rick Bamman - hbamman@shawmedia.com ProTidy employee Racquel Wenberg works to shine the stanless steel stove in a Barrington Hills home on Thursday, March 17, 2016. Wenberg visits the home every two weeks. 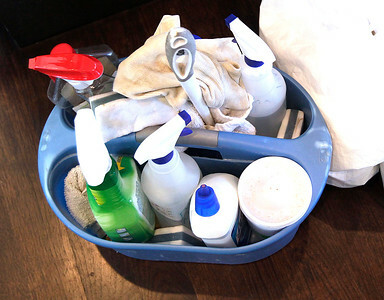 H. Rick Bamman - hbamman@shawmedia.com A container of multiple cleaning products is used by ProTidy in a Barrington Hills home on Thursday, March 17, 2016. H. Rick Bamman - hbamman@shawmedia.com ProTidy employees Racquel Wenberg uses a soft brush attachement to vacuum the entrance way in a Barrington Hills home on Thursday, March 17, 2016. 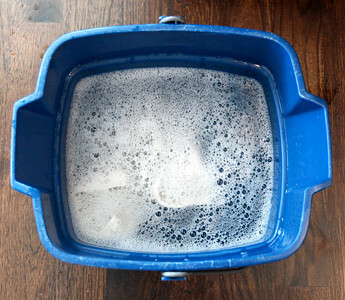 ProTidy workers fist the home every two weeks. H. Rick Bamman - hbamman@shawmedia.com ProTidy employee Racquel Wenberg wipes down a bathroom mirror in a Barrington Hills home on Thursday, March 17, 2016. ProTidy employees 24 people and can serve about 170 houses a week. ProTidy employees use a bucket of soapy water and a soft cloth to clean a Barrington Hills home on Thursday, March 17, 2016.